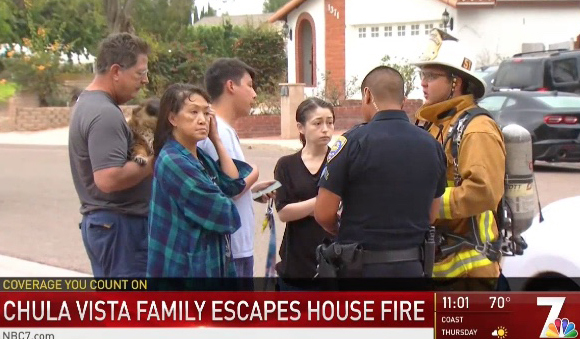 A family of four was home when a fire sparked in their Chula Vista house Monday morning, temporarily trapping them upstairs before they could escape. The Chula Vista Fire Department was called just after 7:20 a.m. to the home on Caliente Loop, near Southwestern College and Chula Vista Hills Elementary School. The initial call stated the family was trapped upstairs but the family was able to get out of the house before firefighters arrived, CVPD Battalion Chief Rob Nelson said. Alexander Godat said he, his sister, mother and father, who is a Navy veteran, were in the house when the fire sparked in their home of about 20 years.